Many of our members may have been wondering what the money from the Spring Open Am-Am fundraiser went towards, as we haven’t made any announcements yet. The reason is we have been passing some ideas around the Competition Committee with regards to how best spend the money and get the most benefits on the golf course. In the past we have spent the money on bins, benches, ball washers and bunker rakes, but we agreed at the last meeting that nothing in regards to course furniture really jumps out as needing renewing at the moment, and that priorities lie elsewhere. With that in mind a suggestion was made about a new hole cutter for the greenkeepers, since the main issue we have on the golf course right now with the bunkers and greens having vastly improved is that we are having inconsistencies with the old holes when we are changing pin placements. This week we had a demonstration of a top of the range piece of equipment called the iPro by BMS, which is used by the best courses on tour, but is at the same time very expensive at around £1,000. That’s why the committee voted in favour of putting the £720 raised from the Spring Am-Am towards this new hole cutter, and that members will see the instant benefit which will keep the holes consistent for years to come. As we enter the new season we’d like to give our members an update of what has been happening at the club over the winter months and what we plan to do going forward. Welcome back Ryan Oliver to the team, after 18 months away from the club, including a year at the world famous Harbour Town Golf Links. Ryan is back to work with the Greenkeeping team for the Summer! We look forward to having Ryan back working at the club and we’re sure that with the extra knowledge and experience he has gained on his travelled, Burstwick will quickly benefit and be in great shape. Welcome back Ryan! As we have discussed in our previous report, we decimated all of the clover and other broad leaf weeds on the course last year, after more than tripling the weed-killer budget. This was very well received by members and in 2019 we aim to continue progress and do the same again. What we are doing different in 2019 is we’ve also fertilised the fairways early Spring to give them a boost of growth before any weeds begin to take hold, this should mean that the weeds don’t get chance to spread on the fairways like they have done in previous years; a form of prevention rather than curing. But don’t worry, any weeds that do appear will be killed again by our team. We have recently cored our greens for the third time in just over 12 months, and this is done to improve the growing profile of the turf, which in turn leads to better, more consistent surfaces all year round. We took extra care when coring this time to avoid any issues that we had previously with some holes being left unfilled with sand, and already you can see a massive difference. The greens are coming back nicely and are showing great signs that in 2019 they will be the best they have been in years! Our focus now turns to trying to increase root growth as we have had issues in the past with shallow rooting on some greens which can cause disease and other issues, so we will keep members updated on how this is doing. We have been continuing to top up bunkers throughout the winter with around 40 tonnes of sand and are confident that right now they are the best they have been in over 10 years. We still have improvements to make but the positive comments that we are receiving from members tell us a story that progress is being made. As discussed above we have fertilised our fairways for the first time in around 5 years to give them an early boost into the season, this will mean that the fairways should have an increased thickness of turf throughout the course, which will produce a more prominent stripe when mowing too. We have began putting in some new irrigation to two of our competition tees on holes 2 and 18, and aim to have these completed by the end of April. This will help the turf on these tees continue to grow and resist wear through the summer months, producing a better playing surface and presentation. We are continuing to conduct a number of irrigation repairs on the course as we still have a few leaks, but with increased research from the Rain Bird website and advise from our Golf Course Constructors MJ Abbots, we are aiming to have all of these solved within the next few weeks for a stress free summer of irrigating the course! In 2018 we made massive steps towards improving the greens, bunkers and fairways, and in 2019 we aim to continue pushing forward for a better golf course. Obviously with a small team we will never get everything correct all of the time but hopefully our members will agree that we are making improvements in the right areas. Around one year ago we prepared a Greenkeeper's Report which talked all about the problems we had faced with the course in 2017, and how we weren't happy with it's progress. Below we have made comparisons to last year's report in order to evaluate what has changed in 2018 and how we hope to move forward next year. In 2017's report we talked about the fact that clover had all but overtaken the course last year and how we wanted to increase the herbicide budget by a factor of two to combat the problem in 2018. We are very please to say that this year we were determined to absolutely wipe out the problem by spraying every single fairway and 80% of the rough areas to completely get rid of clover for the year. We actually didn't double the herbicide budget to do this, we more than tripled it! We had to do this to show the members we were serious about improving the course. This doesn't mean that the problem will go away for good, and we're not naive enough to think that. In 2019 we will need to more than likely spend a very similar amount to keep the clover at bay, and we aim to do just that. Last year our words were that the greens weren't "where we wanted them to be". This was because the thatch level of the greens had grown too deep, meaning the surface was holding too much moisture and the grass roots became much shallower which was a haven for disease, weeds and everything else you don't want on your greens. As part of an ongoing process we promised to begin working hard on remedying this by putting in place a more aggressive aeration programme which would take away more thatch and introduce more sand into the surface to get them back to how they used to be. In Spring we cored with 10mm diameter tines instead of the 8mm tines we used previously (which also go about 30% deeper), and this has had a noticeable effect over the summer, with our greens being slightly firmer and better draining than last year. This is not an overnight remedy though, we will be coring again in a month's time to further progress the greens. Another change we have made is the introduction of a Wetting Agent programme in 2018, to help the roots have access to water deeper into the profile of the rootzone, promoting healthier growth in drier times. Over the course of 18 months to 2 years we should see a vast improvement to the firmness and drainage of the surface, aiding better gaseous exchange for the roots which will lengthen them, and the greens will then become more resistant to disease and be a much better, year-round putting surface. As many will notice we are still suffering with disease on some of the greens (mainly 6, 8, 11), but we will be monitoring this in the coming days and spraying with fungicide if it worsens. As the greens get better due to our new aeration regime this should become less of a problem each year. When we core the greens in September we will be hiring a Sweep & Fill machine, which will disperse the sand into the cores much more evenly then our previous methods, and get rid of any excess sand on the surface, meaning the recovery time from the aeration will be MUCH quicker and the greens will be back to normal a lot sooner. Over the past month we have been receiving a lot of compliments about the difference in the bunkers since we topped up around 40 of them in June. We have opted to begin topping them up on a little & often basis, rather than our old method of waiting for a full renovation when a bunker gets too bad. Previously we felt that full renovation of the worst bunkers each winter would lead to eventually having a full set of 70 bunkers that are better than the year before, but in actual fact this hasn't happened. Instead of chasing the "perfect" bunker by taking out the old contaminated sand and renewing the drainage before adding new, we are instead now going to keep the old sand in and continue to top up with new sand on a more frequent basis. While this means that the contaminated sand will still be in there so the bunker may not look as white as it would with 100% new sand, but the levels should be more consistent and there should be a nice firm base of sand with an inch of 'fluffy' sand at the top where your ball will sit. This method should be a much easier way of maintaining consistent sand levels because it's much less labour intensive. Overall, our bunkers right now are the best they have been in the last two years due to the much better sand levels particularly in the greenside bunkers. We have paid more attention to the bunker edges this year too and they are a lot better presented than in 2017. There are a couple out there that at the moment have a little too much sand in and these should bed in once we get some rain. This coming winter, we aim to get all of the bunkers topped up that we didn't get done in June, so around another 30 bunkers will receive various amounts of sand. As discussed in the News Blog a few weeks ago, we have doubled the amount of new balls for the driving range in 2018, from 6,000 to 12,000. We have also invested in four new Truestrike mats which are a much more realistic surface to practice from, reacting like a fairway to your swing and strike. We have also added new flags to the range and introduced a map in each bay to detail the yardage of the targets. All these little additions help you get the most from your practice. Our fairways have been very brown this summer due to the huge lack of rain since May, and while they don't look as pretty without the stripes, they have still played well this year. As we begin to get more rain in the back end of the season the fairways should green up nicely going into winter. Going into 2019 we aim to give them a feed to get the turf more full and lush, something we have to do because they are built on ex-farmland and do not have enough natural nutrients in the soil. We have conducted quite a few irrigation repairs (three replaced sprinklers, 7 replaced decoders, one replaced valve) this summer to get the system back up to spec, we still have a few small lefts from seals on sprinkler heads which we hope to get to within the next month or two. 2017 was a big learning curve for the greenkeepers and management of the club. Lessons were learned with regards to keeping the course moving forward, and hopefully members will see that money has been put where the proverbial mouth is in regards to killing weeds, and improving greens and bunkers. We still have some way to go but hopefully members and visitors alike will agree that we have made inroads in 2018. The last few weeks we have been concentrating on getting the greens and tees in great shape for the summer, with various over seeding work, wetting agent spraying, application of slow release fertiliser and repairs to irrigation. This has made massive inroads to the way the course is playing, particularly on the greens which are looking very healthy and rolling extremely well. Tees are now growing aggressively and looking very lush so we will begin mowing twice a week to keep them looking tidy. Now our attention turns to finishing the bunker renovations and also topping up a large number of bunkers that need more sand in, at the same time we are spraying a great deal of weedkiller to combat the influx of clover and lesser trefoil on the course. We often get asked why we suffer so badly with clover in particular, and a big part of the reason is that we’re on ex-farm land, which has had decades of work which has taken out much of the natural nutrients from the soil, meaning that it is very susceptible to weeds spreading quickly. To get an effective kill on the weeds they need to be in full growth, so that means leaving them for a week or two before spraying, which is what we have had to do, leading to the rough areas in particular looking scruffier than normal for a short time. We have more than doubled our herbicide budget this year to do our upmost to rectify the issue. In a couple of weeks the weeds will have wilted and the course will be looking much healthier, so we can keep cutting the rough at a shorter height again, it’s unfortunately a process that we’ve had to be patient with in 2018. It has been a very busy week at Burstwick with the growing season now in full swing. Since the wettest winter in the fourteen years we have been open meant that we couldn’t get out and put sand in newly renovated bunkers, our staff have been working hard the past fortnight putting out 60 tonnes of sand, with another 30 tonnes to arrive next week for topping up other bunkers on the course. Also this week we have begun work on manually overseeding greens. This means any small areas that have been affected by disease over the winter, old pitchmarks, and other worn areas are spiked, seeded and rootzoned to ensure new growth will come through. While this may look a little unsightly to some (small, sandy patches on the greens), it doesn’t affect the roll of the ball because it is so flat and within a couple of weeks the grass will have grown through and produce a great surface. Other work we have completed this week had included: cutting the rough down, as it has been growing like it’s going out of fashion these past few weeks; we have also been continuing work on irrigation repairs, I have replaced two decoders to get the 12th green back online and also the third tee, there are a couple of repairs still to do and we are waiting on parts for these. The onslaught against clover and other weeds begins in the next fortnight! We are taking delivery of 20 hectares worth of weed killer on within the next few days, and this will be used to spray fairways, rough, tees and basically anything that has clover on it! To give you an idea of how much 20 hectares worth will cover, the most we have ever sprayed in one year in the past is 12 hectares worth, so we are determined in 2018 to break it's back! We have 12,000 new range balls arriving at the end of June for the range, this is double the amount of balls that we normally renew each year. We are also looking at the possibility of installing three or four new TrueStrike mats, which are the best in the business, giving players a unique feel for every shot, just like being on a fairway! For those who use the range often this should hopefully make a very positive difference to their practice regime. All in all the course is coming on really nicely and the greens especially are running much better now that they have recovered from the coring early season. We're confident that with a more aggressive aeration and overseeding policy for the greens they will continue to improve year on year, starting with 2018. 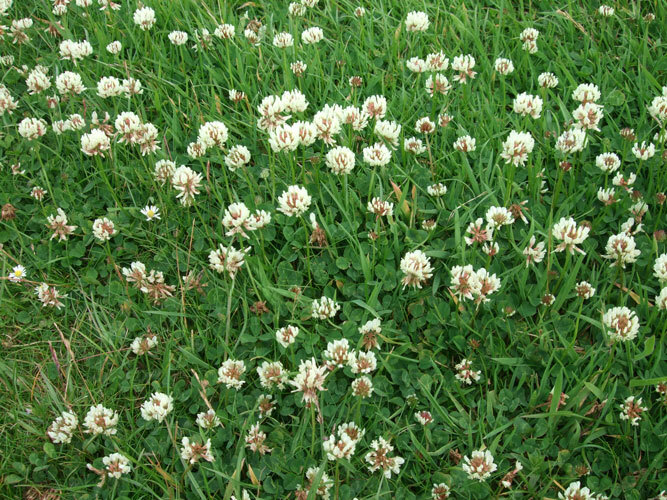 We should see the least of clover and other weeds around the course once it is sprayed in the next fortnight, so the fairways and rough should look much neater and also the speed of play will improve due to fewer lost balls. It is that time of year again when we begin our greens maintenance for the spring. We often get asked what the reason behind this annual maintenance is and why it is so important, so here I’m going to explain a little more. To account for fine turf that remains healthy throughout the year it is all about balance. Balancing nutrients, moisture, organic matter, oxygen and of course wear and tear. The latter, we can’t control too much of as golf courses are designed to be open all year round, but a simple changing of the hole position can spread the wear nicely. With nutrients, these can be balanced by a well-planned fertilising schedule which is suited to the types of turf species on the course, and the growing conditions on each surface. Arguably, the most important part of healthy turf is the oxygen and moisture levels, which is where the greens maintenance comes in as a very important part of our Greenkeepers’ calendar. Enough oxygen within the root system to allow good cellular respiration. This in a nutshell is the reason you will see golf courses punch thousands of holes in a golf green in the spring and autumn. To maintain good moisture and oxygen levels, while providing a free draining surface, we need to aerate the greens. In our case at Burstwick, from this season onwards we are increasing the aeration programme as we have a little too much thatch for perfect growing conditions. The great news is that our USGA greens have the best construction which means that past the thatch level the growing system is basically perfect, so all we have to do is take care of the top three inches or so. This spring we are hollow-coring our greens (basically taking small tubes of thatch out of the surface) with 10mm diameter hollow tines, and refilling these holes with pure sand, and we will be doing exactly the same in autumn too. This will take about 3-4 weeks for the surface to recover and be back to the smooth greens that Burstwick is known for. By introducing extra sand to the surface we are helping the top drainage, and allowing oxygen to enter the root system. This allows the roots to grow deeper into the USGA rootzone later, promoting a strong and healthy plant. On a good green the roots can be over five inches deep, despite the actual leaf of the grass being less than a centimetre! So there you have it. The reason golf courses hollow core (or slice, spike, sand inject, etc) their greens is to improve the growing conditions for the root to create a better surface! If you would like to know a bit more come and see me in the clubhouse and I will gladly give you a more in depth explanation! Rain, rain, rain, and.... more..... rain. It goes without saying that we have had one of the wettest autumn-winter periods since we opened in 2004. Just to put it in perspective, our friend Martin Hayward (Head Greenkeeper at Hessle Golf Club) put an interesting tweet out the other day that said we'd had nearly double the amount of rain between June-December than the previous two years (887mm vs less than 500mm in 2015/2016). It really is unprecedented for us to have been closed as much as we have been this winter, the only time I can remember that came close to this was 2010 when we had six weeks of snow on the ground. Needless to say we've been hard at work doing whatever we can to maintain the golf course and get ready for the summer season, but it hasn't been easy as there have been many days when we couldn't take machinery onto the course. One of the major aspects of maintenance on the golf course we have been doing is maintaining the underground drainage by checking manholes, clearing throughways and exit points. This enables the excess water from all the course get away as quick as possible. Over the last few months our greenkeepers have been hard at work prepping bunkers ready for new sand coming in the next few weeks. As with last year, we are bringing in 90 tonnes of bunker sand which will help us renovate around 13-15 large bunkers and top-up another 10. Each year when we do bunker renovation we target the worst bunkers on the golf course, and begin digging the old sand out. From there we pull out the existing drainage and install new pipe to ensure good water flow, back fill the drainage channel with gravel and cover with a permeable membrane. Once we have all the bunker ready for sanding we’ll bring in the first load and begin distributing among the bunkers at a depth of around four inches, then we compact to ‘bed in’ the sand. Over the first few weeks of use the sand will settle and you’ll have a great playing surface for bunker shots! It's been a couple of years since we've had chance to do some good tree maintenance, so recently on wet days we've been beavering away (excuse the pun), pruning trees around the course. The aim is to remove the bottom portion of branches from the tree for a few reasons: 1) the golfers can navigate through the trees more easily, and 2) less energy is used by the tree in growing the bottom branches, so that energy can be used to grow taller and stronger. As many of you will have seen, there is a poster on the notice board about worm cast suppressant chemical being banned from the market, and that it is illegal for golf courses to use. Not every golf course in the area used this chemical but we used it religiously every November, to keep the worm casts down to a minimum on fairways, tees and greens through the winter months. The knock on affect of this was that fairways would be less muddy and could be mown more frequently and at a lower height. Due to the ban we weren't able to spray the chemical this winter, and subsequently weren't able to mow as much. This has definitely had an effect on the overall presentation of the course but it is a problem every golf course faces and we think you'll agree that these playing surfaces (despite being very wet) have been in more than acceptable condition. As discussed in the previous greenkeeper's report, we are on a mission in 2018 to demolish the clover issues that we experienced last year. We will more than double the budget for herbicides this year in determination to get rid of nearly all the clover. Members will most definitely see a big improvement in this regard in 2018. At the latest committee meeting we have discussed what to spend money on when we receive a donation from the Spring Am-Am in March. Last year we bought five bins to place around the course, the year before we bought four new benches. We discussed having more bins, new plastic 150 marker posts, material for the bridge to make it less slippy, and also new range mats (including looking at the Truestrike mat). If you have any ideas on what you'd like to see the money spent on, please email Alan and let him know. Thanks for reading, here's looking forward to the Spring arriving soon and light nights letting us play as much golf as possible! This year a crucial pesticide has been taken off the market for golf clubs, a chemical called Carbendazim. This chemical is used by many of us golf clubs to prevent wormcasts appearing on our surfaces. Some clubs spray their greens and tees, but we have always applied the chemical to our fairways too. Why do we want to suppress worms? The wormcasts that they leave behind cause us lots of problems. They smear under foot and trolley wheels, creating muddy areas, they are unsightly, they can block up mowers, they cause uneven playing surfaces, they prevent good surface drainage, they help weeds germinate, and they smother grass so it can’t grow effectively. The chemical was been taken off the market earlier this year as it was deemed to be too dangerous to the environment, even though it has been used for decades, and there is no replacement that has come onto the market so golf clubs are actively looking at other ways to control the worms. On the right is a poster that is being circulated by the British & International Golf Greenkeepers Association with information about the ban. Please be patient with your golf club this winter if you feel the the playing surfaces are messier and wetter than they have been in previous winters, it’s probably not their fault! Every club is facing this issue at the moment and we are all going to be doing our best to keep our courses as good as possible this winter! It's been a strange season for us with regards to weeds. Each year we buy a bulk of herbicide (weed killer) to tackle the clover, lesser trefoil and other weeds which this course is prone to, and usually for the most part it's pretty successful. We always spray around mid-May when the weeds begin to flourish and by June they're mostly gone. In the past we've allocated enough budget to do about 50% of the rough areas and a few fairways. 2017 was no different, in fact we purchased another 10% of spray to try and gradually expand the spraying. Unfortunately, the weather beat us this year. We sprayed as usual in mid May, but to our dismay, by mid-June there was over twice as much clover and lesser trefoil coverage than we have ever had after spraying. After closer inspection, a huge portion of this was on areas that had been sprayed with herbicide, which should have been clear of weeds! After some more investigations it was discovered that because of the slow start to the growing season (due to the cold, dry weather - also the reason the greens took longer to recover) there was a lot of weeds that weren't growing so the herbicide didn't achieve the full effect. This basically meant that the exercise was a very costly waste which is extremely frustrating for us. Clover is a golfer's worst nightmare! So we're putting this right in 2018! We're preparing our 2018 maintenance budgets and have taken the decision to increase investment quite significantly into materials; including increasing our weed killer budget by more than double. We've resided to the fact that we're always going to have to battle with clover and lesser trefoil due to the type of land the course is built on, so we need to bring much more water to the fire to get on top of it! Right now as we stand, we would say that the greens aren't where we want them to be. With USGA greens we've always prided ourselves on firm, well drained greens that provide a great growing surface for fine grasses. While this is still true for some part, we need to increase the work that we're doing on them to get them back to where we want them to be. Firstly, let's talk about disease. 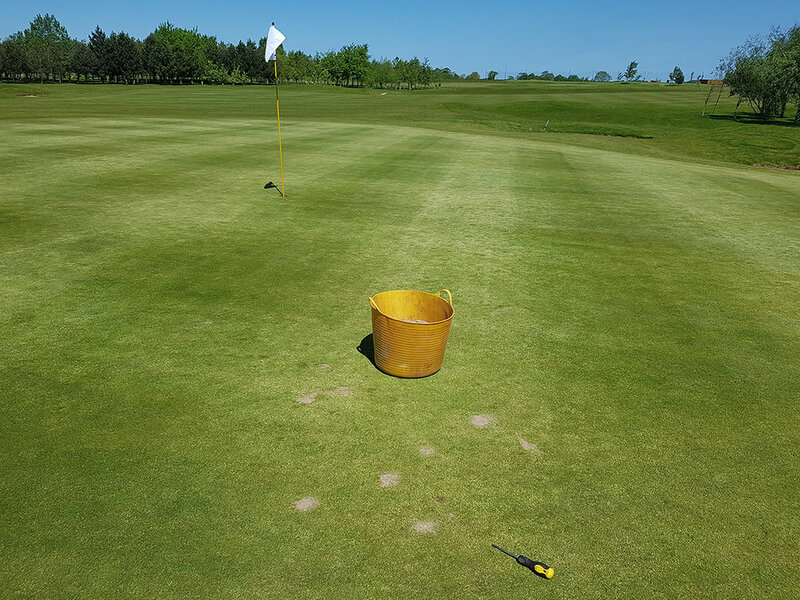 Green number six has been notorious over the past couple of years for suffering from big outbreaks of Fusarium Patch - the Greenkeeper's biggest enemy. Fuzz (as it's commonly called) thrives on moist, warm conditions which is why it is always prevalent in Autumn. Why does the 6th green suffer the most? We've recently had a company in to take some soil samples to find out if there is a difference in the soil make-up, as this could be one reason it suffers more than other greens. An imbalance in nutrients can lead to the turf becoming stressed which increases the likelihood of a disease outbreak. Secondly, we are starting to suffer with thatch problems on some of the greens which adds to the problem of threatening disease. After consultation with various head greenkeepers at other courses, and some meeting with industry experts we have made a plan to increase the aeration and topdressing in 2018 to bring the thatch level down. With excess thatch, the surface stays moist for longer, and the roots tend to shorten meaning the grass becomes more susceptible to stress. By taking out cores and adding more sand into the surface, the greens will drain better (like they did 2-3 years ago) and also promote healthy, long root growth. In conclusion, we will be coring the greens twice (spring and autumn) in 2018, and topdressing with sand both times. We have taken the decision to hire in a top dressing machine for each of these rather than applying manually to achieve a better, more consistent coverage and also take less times before each green is back in play. Extra spiking will also take place on the 6th green this winter to help the surface remain dry, as well as applying a chemical penetrant, designed to pull the moisture away from the surface. The 7th green had an issue recently which was caused by the spiking machine pulling up an area of turf on the left side which was suffering particularly from Dry patch. Unfortunately this was a catastrophic error that we did not foresee happening, and it is with deep regret that this occurred. We have been as quick as possible to repair the area, but it will take time to establish. We have put a small netting around the area to attempt to keep wildlife away and also keep golfers from walking on it. If you could please respect this area we would very much appreciate it. We have had some comments about the tidiness of bunker edges this year, and that they haven't been kept to the same standard as 2016. Whilst we have not spent as much time on the bunker edges, we still believe the quality of the sand and sand levels have improved on last year, but definitely agree that presentation is important and 2018 needs to see this become more of a priority. This winter we will continue to press on with bunker work, and have provisioned a budget to bring in another 90 tonnes of bunker sand for renovation. We will be going around the course and prioritising the worst bunkers to do the work on, and aim to renovate 12-15 bunkers, most of these being large ones. We have had a company come in to quote for a full bunker liner installation, the same as what is used on courses such as The Celtic Manor. This would cost us around £1,500 per bunker on average, and for the time being we feel that this kind of money would be better spent on other parts of the course (weed killer, extra rootzone for coring, etc), however it is good to know for future reference how much it would cost for a complete bunker liner system. There has been a lot of controversy surrounding the bunkers that were filled in last year on hole 12, which we'd like to clear a few things up about. We first came up with the idea back in early 2016, to get rid of the bunkers and put something in their place that would still be a similar hazard but require low maintenance. One option was to fill them in and plant Gorse, but some thought that would be too punishing; another was to plant heather as a similar idea, and; the last thought was to just grow the grass a little longer across there so that people can still find their ball but the rough would be enough to consider another option to avoid. When we first filled them in last summer year we were ready to prepare to seed but received a lot of negative feedback that we hadn't put enough material there and that they were too flat. We then took the decision to put more than double the material on there to raise them higher, which meant we had to wait another full winter before it was dry enough to take these huge loads of soil across (otherwise the machinery would have torn the surrounding area up). A total of 350 tonnes of earth has been put into this area. We have now finished the mounds and have seeded the areas. Once they are established in Spring we will look at whether to plant heather or to let the grass grow a little longer, and will canvass opinions of golfers on this. The main thing is we get these back in play as soon as possible, because they have been out of play way too long already. The problems with dead patches of turf on the edge of the putting green has been causing us a great deal of frustration this year. The black patches you see on the green are areas of completely dead grass, which will never grow back. It needs to be removed. Until now, our only option has been to seed areas like this, but it's difficult to get the seed to establish without closing the full putting green. We have now managed to find a company that supplies fine turf of the exact same specification as our greens, with an 80:20 mix of Fescue and Bent grass. We are going to make arrangements for buying some of this turf and replace the dead areas on the green so that we can look towards having a fully healthy and completely open putting green as soon as possible. We have another batch of 6,000 driving range balls due to land in the next few days, and we hope to have these in play within a week. Many of the older balls which are looking very tired will be pulled out and replaced by the new balls. We are also looking at ways to enhance the outfield of the range, as the three main targets have not survived the prevailing wind very well. We are looking at enhancing these existing targets with some new PVC on the frames and also adding a couple more, shorter range targets in the next couple of months. This Greenkeeper's Report seems a little doom and gloom compared to past reports, but we are keen to stress one thing. After the 2017 season we recognise many areas where we can improve going forward, and we are determined to do so. With a bigger budget and better planning we can solve the few issues that we surround the course: clover, disease on greens, bunker improvement, and the putting green issues. We are confident that we have a strong plan going forward and although nothing in the plan is an 'overnight remedy' we are passionate that we can significantly improve the course in 2018. Hull accounting and business strategy specialists Smailes Goldie Group have kindly sponsored some brand new aluminium phosphate hole-cups for the golf course. Previously we have always had plastic hole-cups which wear out easily and don't hold the flag completely straight after just a few weeks of use, so we're sure that golfers will much prefer the new cups, especially with the more quality sound when the ball is holed out! Today we received official confirmation from England Golf and the USGA that our Men's Standard Scratch Scores have been updated, after we have made changes to the length of the course including adding around 150 yards of length and also bringing trees into play and changing some holes slightly. We are delighted to say that we have achieved our target SSS which was to put +1 shot on each the whites and the yellow tees, which are now 70 and 68 respectively! These are effective from last week's competitions and will be showed on the results. Basically, what should happen now is that everyone's handicaps reduce over time by approximately one shot (or just under). As an example, if you were to shoot a score of 85 off the white tees, on the previous scratch score (69) would have meant that you effectively played to a 16 handicap. If you now shoot the same score, you will be effectively playing to a 15 handicap. This is especially good news for those looking to try and get in a lower division, get to single figures, or just hit their target handicap. On Saturday we hosted 46 teams in the Joe Coyle Fundraising Am-Am, the biggest event we have ever held at Burstwick! In preparation for the day our greenkeepers were working hard getting every inch of the course mown in order for it to look it’s best come Joe’s day. All was going very well until Friday morning, when we had a major breakdown on our greens mower. As we rang around suppliers we soon realised the part we needed was not available anywhere in the UK, so there was no chance of receiving it in time for Joe’s Am-Am, and the greens being cut for the event was absolutely imperative. This meant that head greenkeeper Mark had to set out and hand-mow all the greens, which takes about 50 minutes per green! Because it was such a long job, Mark spent until 7.30pm on Friday night mowing the first 13 greens, and then was back in at 5am Saturday to finish the other five and practice green. The result was superbly vividly striped greens on a course that was looking it’s best! This meant we received a flood of Facebook comments, Twitter mentions and even emails saying how great the course looked for the Am-Am. Credit to Mark and his team for their hard work! Fantastic day, course looked and played great, lets hope we all did Joe proud! To Mark and the greenkeepers, impressed to say the least at the way the course was presented today for the Joe Coyle fundraising AM AM. The mowed lines on the fairways and the greens added so much the aesthetics throughout. Stand back and take a pat on the back. I'm sure this will not be the only praise you get today. A cracking Open Am-Am; and 46 teams is a huge achievement! The green keepers all need a pat on the back! They were far and away the best greens locally that I have played this year! We've had a very busy winter on the golf course and our Greenkeepers have made excellent progress on the winter plan which we showed back in Autumn 2015. Overall we have managed work on 12 more bunkers than we had originally planned - a total of 44 bunkers - which has made a massive improvement to the course and hasn't gone unnoticed by members of the club. Mark and his team have received a lot of recognition over the past few months and it is fully deserved. One of the winter projects involved improving the presentation of the lakes on the course, as many had been overtaken by unwanted weeds and algae, so we put in a plan to physically remove a lot of these, with the idea of long-term continued maintenance to keep the lakes looking presentable, as originally intended. When removing bulrushes which have naturally spread within the lakes we have been conscious that they encourage wildlife in our lakes and we did not want to prevent this, so with that in mind we decided to keep half of the bulrushes on the second, fourth and eleventh lakes on the non-playing sides. On the sixth lake we decided that all of the weeds should be removed from this as the whole lake involves play, so that was the only lake that we have cleaned completely. The new practice putting green has received a lot of use over the winter months and we're very happy with the way it has coped when you consider that it takes a few years for a green to fully establish. Although there are still some slight imperfections with the surface we are very pleased with how it is performing. We are planning on installing irrigation for the green in the next few months, so that it can be irrigated every night through the summertime. As planned we have installed new mats, new nets and targets on the driving range (as well as 6,000 new range balls) and these have greatly improved the appearance and quality of the range. You may notice that one of the three new practice nets (the red one) disappeared shortly after it was put out on the range, this is because it was badly damaged in high winds within a fortnight of installation, so it has been away for repair to both the structure and the canvas itself. This will shortly be back on the range and it will be as good as new! The new competition tees on holes 6 and 10 have faired well through the (very) wet months, and should kick on nicely in 2016. Can we please ask that people don't bring their trolleys onto these surfaces (or any tee for that matter! ), as this affects the presentation and wear of the tees. Thank you. We have set up a new Twitter account for the Greenkeeping team at Burstwick. Follow us at @BCG_Greenies for updates on what's going on around the course, and what is planned for the future! In the coming weeks we will be removing the blue stakes from holes 3 to 11, meaning that there will be no blue staked areas remaining at Burstwick! Many of these areas will still have individually staked trees (as with holes 1-2, 12-18) and players must take relief from these individually, rather than relief from the full copse. We are going to trim around the tree bottoms before we remove the stakes, so that players are able to find their golf balls (and we will be doing this on the other nine holes too, shortly after). If you have any questions about this, such as how to take relief, please talk to a member of staff. As many people know, we bought 4 new benches with the money raised from the Spring Open Am-Am. We have not had the conditions to put these out yet, as we are going to concrete a base for each bench and secure down. Hopefully we will be getting these out on the course in the next couple of months. Whilst we're very happy with the progress we have achieved over the winter our attention now turns to maintaining the course through the summer and we are sure that in 2016 you will see the course in the best state it has ever been! Another Four Bunkers Completely Renovated! 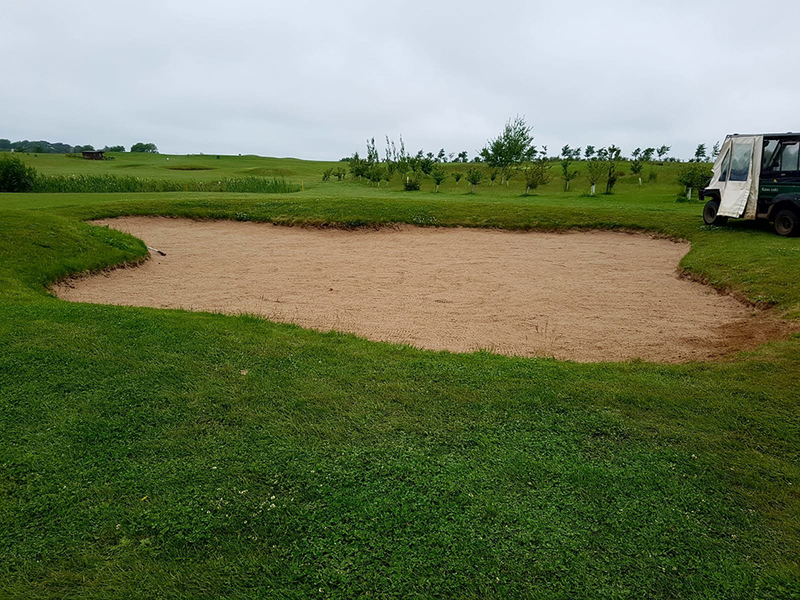 We're pleased to say that after a break in the renovation project due to the wet weather, Head Green Keeper Mark and his team have cracked on again with bunker work, and another four bunkers have been completed! We're delighted with the progress so far, and bunker renovation work will continue into early Spring, ready for the golfing season so watch this space for further improvements! In late summer we released a plan to members and visitors about our plans for improving the course and driving range over the winter, and we are pleased to report on the progress. Mark and his team have been very busy over the last few months, and a mountain of progress has been made so far. Our winter maintenance plan for bunkers was to fully renovate 19 bunkers, top up 13 with sand, and also fill five bunkers in. We are two months into the work and so far the Greenkeepers have fully renovated 7 bunkers (37% complete) and topped up 7 bunkers (54% complete). If we continue at the current rate we may be able to add a couple more bunkers to the plan, but there are many external factors that will determine this, including the winter weather. Below are some progress pictures of bunkers already completed. We opened the Practice Putting Green at the end of October, which was later than scheduled due to some areas not establishing as we'd predicted. Now the green is open we look forward to the turf growing stronger and thicker over the winter months, after getting used to constant use and maintenance. We feel that at the moment the practice green is performing around 85-90% as good as the original greens due to it being in it's infancy, and the plan is to top-dress the surface in Spring to even out any discrepancy areas and by this time it will be identical to the other greens. You may well have noticed that a couple of our greens have been suffering from disease lately. This is called Fusarium (also known as Fuzz) disease and it thrives in warm and moist (dewy) conditions, so many courses suffer in Autumn. As this autumn has been especially mild Fuzz has attacked a couple of our greens (luckily most of them are fine), with the 6th being the most badly hurt. We have sprayed fungicide twice for Fusarium since September which will stifle it's progress, but you cannot reverse it's effects. Once we get into Spring we can reseed any affected areas and move in to Summer with perfect greens. As promised we have made some exciting upgrades to the Driving Range to enhance your practice and make you a better golfer! Starting with 6,000 new range balls, four new mats, 3 new targets, and a re-arranged plan of old targets and flags with specific distances as shown on our range map to the left. You will find copies of this range map on the back of the driving range so that you always know how far each target is. The range now looks great and is attracting more people to come and practice before their round or on an evening when the floodlights are on. We've also re-introduced loyalty cards with extra discounts for frequent users! There are just a couple of repairs to some dividing nets (which are due soon) and then we the range maintenance and upgrades are complete. When we last cut the rough in October we decided to mow it a little lower after feedback from many of our members saying that it was a little too harsh and also slowing down play. We feel that now the trees are in play on the old field and the trees will be brought into play on the new field next Spring, that it is a sensible move to cut the rough an inch shorter to compensate. Feeback we have received on the shorter rough has so far been very positive, but if you think otherwise please talk to us! New Practice Putting Green Opening this Weekend! It seems like a long, long time ago since we announced the construction of the new practice putting green at Burstwick and due to a few things outside of our control, it has taken longer than we expected to get to a point where it’s ready to open. Well, I am proud and happy to see that we are now at that point; the new putting green shall be open for business from this Friday! We have been over the last two months accelerating the maintenance of the green to bring it inline with the rest of the greens on the golf course, and last week was the first time it had been cut at the same height as these. There will be five holes on the new green, and these will be changed on a much more frequent basis than the original practice green. As golfers begin to use the new facility we would like to remind them that it may take six to eight months to begin performing like the rest of the greens due to it taking time to bed in with constant use and maintenance, but it will perform fairly well from the outset.